Dogs and cats make great companions in a home. However, the dander they leave behind is a whole other story. Many people suffer from allergies caused by the dander left behind by pets. In order to ensure everyone who comes to your home is able to breathe easily, there are a few things you can do to improve your indoor air quality. Making sure that clean air is constantly circulating throughout your home is the easiest way to ensure that pet dander is not allowed to linger. For this reason, it is a good idea to get your ventilation unit inspected annually. These checkups will give you valuable advice on what needs to be done and what you can do to better take care of the system. Something you can do on your own is replacing the filter often. Dander can dirty up the filter sooner than anticipated, so inspect it once in awhile. In addition to having high-quality devices that allow for superior indoor air quality, you should also take care of a few chores around the house if you have pets. 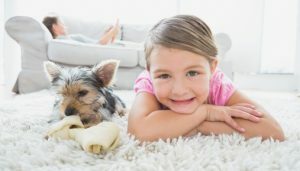 Vacuum often to remove fur from carpets and rugs. Another action you can take is ensure your dog or cat does not jump on the furniture. This is simply another place where dander can build up. Preventing animals from getting on it in the first place is a good way to keep people with allergies comfortable. Finally, better air quality inside can be as simple as opening up a window every so often to let some fresh air in. People experiencing pet allergies might start to sneeze incessantly and get watery eyes and itchy skin. Do not let anyone go through that just because you have some pets. Follow a few simple tasks to enhance your indoor air quality.